Beware publishers who using and place BidVertiser ads units on their websites. BidVertiser is a CPC (Pay per Click) advertising network that many webmasters use as alternative to massively Google AdSense, or to supplement the income of AdSense with revenue from BidVertiser. Its strength and goods lie with low entry barrier with automatic acceptance into program and approval of account, instantly payment via PayPal with $10 minimum earned, customizable ads layout and possible higher average price value per click on ad plus referral system. Out of this reason, I applied for a BidVertiser account. After confirmed the email and customize the ads template design, the next natural step is to generate ad code and place it on the website. Out of my surprise, the ad unit code that been generated actually contains a “No Script” section, with link back to BidVertiser website on “marketing” keyword. This will obviously create thousands of back links to BidVertiser with marketing anchor text in the inlinks. NOSCRIPT is not certainly a bad thing. In most case, NOSCRIPT been used in cloaking method that ethically increase accessibility of a site to users with disabilities, or provide human users with explanation content when scripting feature of web browser is disabled. And certainly it’s not related to ads serving or delivery to publishers who taken the bait to give BidVertiser their websites’ screen estate. Thus, BidVertiser in my opinion has been dishonest, unethical and commits cheating in trying to boost its website ranking in certain keyword such as marketing. 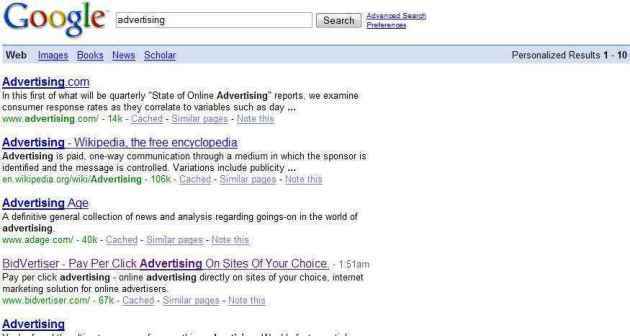 Marketing is not the only key terms that BidVertiser hoping to cheat Google and other search engines in. If you as a WordPress blog owner, and download BidVertiser widget plugin for WordPress, BidVertiser tries to target links with “affiliate program marketing” as anchor terms. Update: Apparently the issue has been taken care of on Google, and Yahoo! is now using search results from Bing, renamed from Windows Live Search. The results is pretty instantaneous and complete success. Affiliate program marketing ranks number 1 on Google and Yahoo! For the highly competitive keyword “marketing”, BidVertiser ranks respectable 7th on the front page of Google, 5th on Yahoo. Other keywords that BidVertiser fooling the search engines’ SERP (Search Enging Ranking Position) include “make money” (also top ranking on Google and Yahoo), “internet marketing” (5th on Google and 9th onYahoo!) 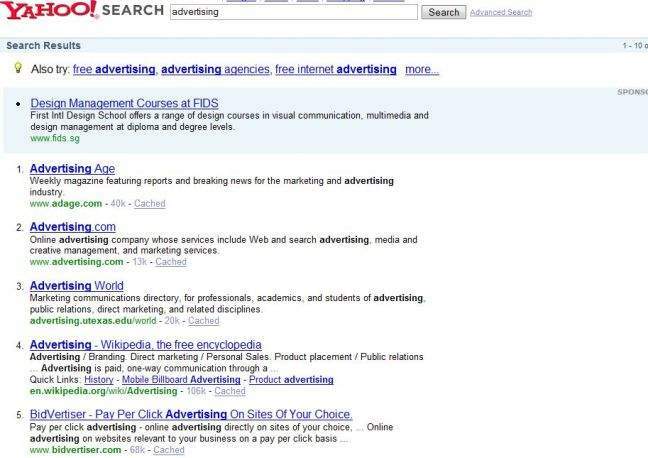 and “advertising” (4th on Google and 6th on Yahoo!). Weird thing is that Windows Live Search (now Bing) obviously isn’t taking the bite, and BidVertiser website is nowhere to be found for these search terms. Probably Windows Live Search ignored the noscript tag. It’s not wrong for BidVertiser to engage in search engine promotion and optimization to promote itself. However, by conning and tricking publishers to unknowingly giving away valuable page rank and backlinks to BidVertiser on high value keyword without any payment or compensation. If BidVertiser buy text links on those websites, it’s going pay to pay tens of thousands if not millions for this kind of amount of inlinks, keywords, and hosting websites’ page rank. I just wonder if BidVertiser dare to cheat and take advantage of their publishers, what else they not dare to do? How about “click fraud” in the sense of not counting valid ad clicks, is not to make me nervous. Not sure whether Google and Yahoo! will penalize BidVertiser for this practice or not, as it’s not paid links but voluntary (should be cheat) links, but once search engines start to penalize BidVertiser, those linking without knowledge to BidVertiser is considered to be linking to bad domain, and might affect own ranking instead. So, it’s better safe than sorry, and drop all ads unit of BidVertiser and links to it, or at least add a “nofollow” tag to it.